When webmasters talk about the accessibility of a website, they are talking about how a person can approach your website through different mediums. Can mobile users view your site conveniently? Are they able to understand the message that you are giving out? With the exponential growth of new devices, it is important to target audience on different platforms or else you will be losing your potential leads. It has become indispensable for entrepreneurs to ensure that their customers enjoy an engaging and perfect user experience irrespective of the device they are using to access the site. If you are also planning to improve your responsive website design approach, it is always better to hire a responsive website designer. Experienced professionals will help you to avail maximum benefits by converting your website into a responsive one. However, if you are on a preset budget, you can use these tricks and tips to improve the design approach. Before we start with the designing process, it is important that you understand the importance of responsive web design (RWD). 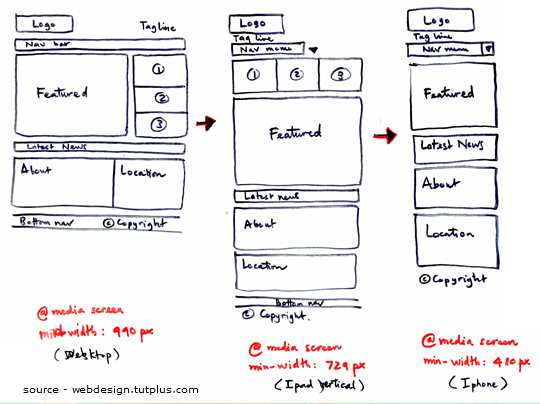 An RWD comes with fluid grid that makes it easy for the website to adapt according to the screen size of a device. Moreover, converting your present business website into a responsive design would be an economical option and the website will look good on the screen of different handheld devices. Now let’s move forward and list out different tricks that will help you to improve the design approach. When designing the best responsive website, make sure you find a program that will help you to compress the page resources. In other words, choose a program that will help you to drop the number of bytes sent per page. This process generally makes it easy for the visitors to browse through the website or access it easily. This will also decrease the loading speed of the website and make it easy to navigate. You can further speed up the things by removing line breakers or excessive white space. Decreasing the file size will keep the things flowing more smoothly. Content may be regarded as the king in the SEO field, however, removing extra content from your business site will help you to make it mobile friendly. Before improving your business website, remember that some content was never meant to be used in the mobile version. There are high chances that some content and content element would never work in the mobile environment. If you are not active on different social media networks, it will make sense to remove them from the website. Navigating a website is different on handheld devices and on a desktop, therefore you must understand this difference. Navigating through the smartphones can be difficult and there are high chances that the visitor may get lost. So, get rid of all the clutter that is present on your website. When improving your business website, it is important that you understand the requirements of your target audience. Find out what your potential customers are looking for and make sure you fulfill their requirements. By known about your actual target market, you can easily design different solutions and services that will help your company to remain ahead of the curve. You can also do you own analysis to find out which part of the website is viewed the most and which device is used to view your business site. By having the stats, you can easily do the comparison and take the right decision. Designing the website by keep your mobile users in mind will make it easy to include all the necessary elements and remove all the clutter. Arrange the content and functionality that must be available to the smartphone users and then progress toward including different elements for desktop users. Smaller screen size makes it mandatory for the designer to remove all the unnecessary elements. In certain cases, the entrepreneur would like to fill every pixel with different details, however, this will only make the site hard to navigate. So to improve your business website make sure to include only those elements that are absolutely necessary. Images form an integral part of a website and one of the biggest problem with full sized images is that they can slow down the website’s speed. Due to the presence of heavy images, the website will take up a long time to load which can make your visitors move on to some other website. Therefore, instead of using high resolution images, scalable vector graphics can be used. Moreover use the images where they are necessary and make sure to design the logo with scalable vector graphics. You can also use regular resolution images that look like high resolution pictures to attract more customers to your business site. Having a responsive design for the business website is seen as an invaluable tool. A responsive design makes it easy for your customers to browse your website from a tablet, desktop or a smartphone. A responsive design also helps you to feed your customers with a small amount of content at a time so that they can easily understand what they are reading. A well designed website will make it easy for you to convert the customers into potential leads. As a business owner, you are always looking forward to earn money and an RWD gives you a chance to target your customers easily. So convert your website into a responsive one and make sure you do not miss your leads.